Sorry if this seems a little TMI to anyone... I'm not the best judge of that sort of thing when it comes to dancer-y positions! Yes, I'm loving the yoga stuff. I know I've written about it a lot already, but you have yet to hear my report about the dvd I purchased from the Seattle Holistic Center. It's good! It's pretty easy, but I am glad to have something to pace me and sort of explain the imagery and benefits as I practice. I'm seriously considering making myself a cd or something so that I can have my own specialized guide through my own specialized routine. I've added lots of Pilates based exercises to my list of yoga stuff as well as my physical therapy exercises for my lower back. I'm hoping to get some PT stuff to do for my stinkin' rib cage too because it's really bothering me. I'm pretty certain that one of my ribs is out of place. The more I read about active birth the more excited I am getting to try it. Now, I understand quite well that things don't always go the way you expect and that I shouldn't have unrealistic expectations for myself or Spud. So, don't worry about that! Meanwhile, I'm happy to just feel hopeful about a best case scenario while emotionally accepting the possibility of a worst case. I feel like I'm getting ready for a performance. I LOVE that I can rehearse everyday with Spud for his big debut! It has been extremely difficult for me to find a rhythm of taking care of myself through exercise all these years since I stopped dancing. I was able to ride a wave of leftover being in good shape for a few years, and I did have to be good about keeping up on my pt exercises. But, other than that, I've just felt like, "what's the point?" I have good genes and eating habits, so I don't worry about my weight, a reason many people can cling to for continuing an exercise program. Ballet sort of ruined having a pure love for fitness for me. With ballet, there is always a goal: an audition, a part, a job, more rotations on your turns, higher legs, higher jumps, a more beautiful performance, and on, and on. Having a strong, thin body is more like a pleasant (and necessary) side effect rather than a central goal when you're pursuing a professional career in dance. So, now, it's amazing to finally have a new purpose for my movements that's about something positive (a healthy birth and baby) rather than about something negative ("if I don't do these exercises, my back will hurt more"). Spud is being such a fun little guy. He kicks a lot, and I can always tell if he's asleep or awake at a given moment. This is a little cheesy and maybe a little too new-agey for some, but I also am certain that my practicing my breathing and mindful rest is helping me to have a new awareness of what Spud is doing in there. I feel really bonded with him because so much of each of my days is about him. I eat what would be best for him. I exercise for him. I pray for us. I definitely feel inspired to keep working to be healthy for him. Even after he's born, I think that having clearer goals for my physical maintenance will continue. I'll want my old body back, once he's born. And, then, I'll be ready to make sure I'm in shape for subsequent pregnancies. Of course, we'll see how things actually turn out! I recently had a conversation about crock pot meals, and a friend mentioned that it's hard to make chicken any good in the crock pot. So, this week, I had some chicken and thought I'd see what I could do. I came up with a Carribean salsa chicken dish in the crock pot that was super good. I put chicken (breasts, but I think anything would work), frozen pineapple chunks, and homemade salsa (tomatoes, jalepeno, red onion, lime, cilantro, s&p) in there on high for 2 hours. At that point, I used forks to sort of shred and break up the chicken and stirred in some cornstarch dissolved in water to thicken the sauce. Then I let it go on low until we were ready to eat... probably another hour and a half. I served it with black beans (with garlic, salt, and cilantro) and Spanish rice. I topped it all with sliced avocado and a spoonful of sour cream. It was a successful chicken in the crock pot attempt! I might pull it out the next time I have to feed a bunch of people. me: Hi Friend in my country! i am blogging...gotta keep everyone informed! which i think you need more of little missy! So, I decided to do my buddy a favor and take pictures of my "boring life" for a few days :). Notice that pictures really only were taken when Rib was around! I'm horrible at remembering to do it myself. 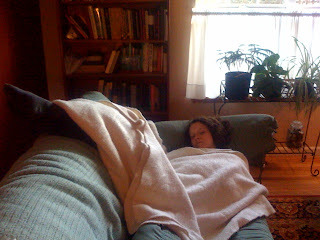 Otherwise, I'd have pictures from cooking for Maundy Thursday (and the bad allergy attack I was having the whole time! 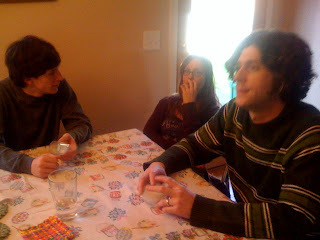 ), my fun dinner with two of my favorite people under 4 years old, and women in prayer or something. But, as my little friend would say, "Ya get what ya get, and ya don't get upset!" Funny thing is... a few of the pictures are of things Beth doesn't like! Guinea pigs and mushrooms! Blackberry figured out how to block Brownaby from the food bowl. It only worked for a second, but we thought it was hilarious. Brendan stirring the mushrooms mid-roast. The recipe for these roasted criminis came from my Well-Rounded Pregnancy Cookbook. Apparently, mushrooms have lots of good stuff in them! These were roasted with balsamic, garlic, thyme, and oregano. Rib did an awesome job! Me starting the sauce of organic fire-roasted tomatoes, sugar, olive oil, S&P. The rest of the flavor came from the shrooms and everything in which they were roasted. Out on the town... in the parking garage. Rib found $5 on the ground outside! My preggers Easter dress that Brendan got for me at Gap Maternity. I made a little Easter surprise breakfast for Brendan. I usually make him an Easter basket because apparently they didn't do Easter baskets when he was growing up. They weren't a huge deal at my house, but I did always love getting one! To me, they are sort of like giving Christmas presents. I like to celebrate Christ's love for us by taking an opportunity to show some love to my love! I made cornbread because I had a dream about it, and it's an awesome excuse to eat honey, which Rib loves. He also likes grapefruit. This is Brendan making coffee for us with his new Aerobie Aeropress. We really like it as it can make espresso-like shots, and we can make our own Americano's without having to buy an espresso machine... which is still on our list, but the aeropress was only $20! 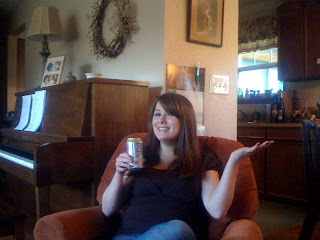 How I wound up Easter afternoon at the Grown-up Ribera's. My ribs were really hurting, as they are almost every day now, so I had to lay down. Being flat, of course, almost instantly results in a nap these days! 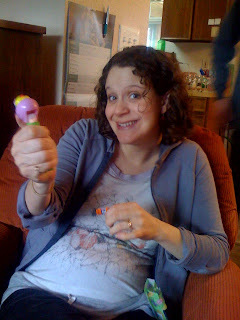 Me and my Easter Pez dispenser from Laura. It has a chick on it because that's what I am! You can see the little buddha belly Spud there. Mark, Joel, and Kletia after our delicious Italian feast. Jordan's new girlfriend (3 mos), Candiece. I have chosen that title because I have officially entered the THIRD TRIMESTER! As I told my mom-in-law the other night, when I hit the second trimester, I felt great and thought, "Awesome, maybe the 2nd trimester will be as fun and easy as all my books say it is." Lo and behold: it was! So, the last couple of days I've been feeling super tired, heartburn-ish, and my back is starting to hurt again. Now I'm thinking, "Oh crud! maybe the 3d trimester will be as lame as all my books say it is!" Even if it is lame, that's OK! I'm so proud of Spud for getting this far; this week, he's got a 74% survival rate if we have a pre-term labor! I think that is really cool. I can tell that he's run out of excess room in there, so I'm expecting exponential growth. I've gained about 9 pounds so far... I think we've got a ways to go! Expect good pictures soon. Even though I don't look very big (which lots of people point out...) I definitely feel big! I know I'll get bigger, and this is nothing, and blah, blah, blah. But from ballerina body to this? That's a big change! These days, I'm eagerly awaiting the arrival of my prenatal yoga dvd from the Seattle Holistic Center. I've heard great things, and cannot wait to get started with it. I've been doing yoga stuff from a couple of books I have for a few weeks, but doing it while reading is sort of hard. You don't get the nice flow from pose to pose, and I've always been AWFUL at pacing myself and my breathing correctly. I'm too speedy. Meanwhile, I'm still enjoying its effects along with the benefits of my pilates breathing and exercises, PT stuff, and even some barre exercises from ballet that I've been doing. I somehow lost the ability to do a freestanding grand plie in second position (a good skill for an active birth... imagine a wide, turned-out squat), so I'm working to get that back. It better not take long! I had no problems doing it almost everyday for 20 years! I really enjoy doing meal planning and cooking for folks. This Thursday, I get to help with the Maundy Thursday dinner before our Communion service at CrossPoint. I've planned large soup meals before, but I think this one is the biggest: soup for 150. We're going to make a chicken noodle, a broccoli cheese (I'm excited about that one), and an Italian lentil for those of the veggie/vegan persuasion. I've lately perfected my lentil (fresh basil and balsamic!) and chicken noodle (fresh thyme and a little extra garlic... and noodles go in LAST MINUTE) soup recipes, so I'm really excited about making those for everyone. I'm going to do a test run on the broccoli cheese tomorrow or maybe tonight so that I can be sure that one is good too. We won't exactly have fudge room for a whole batch of soup to turn out gross! I really like cooking with other folks too. I'm looking forward to getting to better know some of the other women who are helping. We have so many new people at Green Lake, and it's practically impossible to get to know anyone well in the 10 minutes after a service! Especially when you're pregnant, and all you can think about is peeing and getting home for lunch and a nap :). So, CrossPoint readers, I hope to see you Thursday! Happy St. Patrick's Day, first of all. Second, TODAY IS THE DAY!!! Beth and Dan are finally coming back for Eli's big arrival (not due until the end of May). If you read this before Tuesday afternoon, they are still in the middle of traveling, so please pray for them. I cannot wait to see them and the Partains too! I told Beth that I'm excited to hug her and see if the boys try to kick each other :). It's so weird that we both are pregnant. The thing that strikes me the most is that now Dan and Brendan are both daddies. Last time they saw each other (on that super-NOT-fun day at the airport), they were just two silly friends... now they are two silly friends with kids! Rib was a dad already be then, but this time it looks like Spud will actually make it out here :). I guess it's equally strange or mind-blowing or whatever that Beth and I are both mommies; but, for some reason, that doesn't surprise me as much. She and I have been talking about kids forever since she's been a nanny since I've known her, and I just love kids... and then sort of nannied for a couple years too. It will be SO fun to talk about our own kids! Actually, that already has been really fun :). I'm officially counting down the days now... 19 until (Lord willing!) I get to hug everyone! And, Meador family, it's making me sad that I won't be seeing you to give you hugs too. I'm used to having the promise of seeing y'all at the end of my plane rides. Well, soon enough- only 3 1/2 months until I see you too! Second, I started reading the book about "active birth." WOW. Intense, but I'm actually really looking forward to it all. Thinking about doing that made me feel more than ever like I'm not in Kansas anymore. You know what I mean: the Kansas of childhood. Deep. Far out. Awesome. Woah. Ok, I really do mean that- all joking aside. Giving birth to a child is like the quintessential adult female activity. (Rib just came to read over my shoulder and said, "the quintessential adult female activity! Your feminist professors are rolling over in their future graves!" So, I guess I should be more specific: the quintessential activity of the adult female body. Also, it's not the most mature thing the body can do... that would be dying preceded by the penultimate event of menopause. Yeah, I know women can reach other heights than childbearing... don't worry UW!). So, I'm not saying I'm super mature or have any great adult wisdom... far from it, actually! However, dentists and active birth: pretty adult stuff. I've been thinking about this Psalm a lot this week because we sang a song based on it at church last Sunday. Nathan wrote it, and it is based on verses 22-31. Brendan and I always loved the song, and we chose it to be the corporately sung song at our wedding. My dad always says that we were like "rock stars" up there. The melody is exuberant as are the words, and I've never felt more exuberant than that moment right after we exchanged vows! So, we probably did seem more energetic in our singing than usual :). Because it was our "wedding song," I always get choked up when we sing it. The words meant a lot to me when we sang it that day. The psalm speaks about praising God because of his goodness to us, and the psalmist feels it is crucial to worship him publicly and to fulfill our vows made to the Lord. It was SUPER appropriate for a wedding, especially when the wedding is the result of a relationship developed in a crucible of pretty grown-up trials for a really young couple- scary illness and career devastation. I have always known how important those experiences were to Brendan's and my development as a couple (heck! as people), and I have always been exceedingly impressed by God's goodness to us throughout them. The wedding felt like the culmination of lots of waiting and lots of evidence of God's blessing and provision. The other interesting thing to me about this psalm is that the first two-thirds of it is majorly depressing. It starts with those famous words, "My God, my God, why have you forsaken me?" David is worn out and feels threatened by all the danger and sin that surrounds him. But, as he preaches to himself throughout the psalm, the mood becomes more and more joyful. Joy is the inevitable result of truly reflecting on what the Lord has done. So, of course, with Spud in my belly and that sad time of the summer falling farther behind me, I'm becoming more and more joyful too. It is true that "he has not despised or disdained the suffering of the afflicted one; he has not hidden his face from him but has listened to his cry for help." v. 24. I really wish that everyone who has or is suffering could feel that way because, even though it is very true, not everyone gets to see it or feel relief in this life. But, heaven is our home. Is the baby eating that pizza right now too? How do you tell the difference between someone who is pregnant and someone who is just fat? (that was my favorite!) This is Brendan's maternal grandma- Grandma Clark. That's GG (great grandma) to Kimi, Quinn, and Spud! From your left to right: Uncle Gerard, Jake (cousin in law), Quinn, and yours truly. I felt about as hazy as I look as I was MISERABLE with allergies. Yeah, I look drugged or something! But, more importantly, I'm wearing the cute preggers t-shirt that Brendan bought for me for Valentine's Day. I do a lot of cooking these days, and it's been more fun than ever with my great, fresh ingredients from SPUD.com. I also recently made a root vegetable soup with potatoes, carrots, and parsnips and a creamy tomato basil. They were both crazy good! I made some latkes too- a project I've wanted to try for a while. Chocolate muffins were a big success, but my recent apple cinnamon oatmeal cookies were pretty disappointing. If you have an oatmeal cookie recipe that results in flat, chewy cookies, send it to me! Mine turned out sort of bready. Apple Bread: a new favorite around here! This is the start of a Giada recipe for spinach rollatini. After cooking the noodles, they are spread with a spinach filling. We've been busy, I guess, since Wednesday when I last posted. Wednesday night was really funny. Brendan decided to be nice and take me out on a date. It was a very pretty day on Wednesday, so I went to U.Village to walk around. I got a new sweater at Gap Maternity (very good sale going on! ); and when I got home, I spent about 2 hours trying to put myself together for my date. Brendan rode his bike to work that day, so I knew he'd have to shower when he came home. I made a reservation for 7 and checked in with Rib multiple times in the day to ask if 7 was still going to work for him, but at 6:48, I was still home alone. Now, old Jessica would have gotten really upset and would have been prepared to receive Brendan with all a Fury's wrath because how dare he be LATE? THE BIGGEST SIN THERE IS!!! Now, that is psych0 and not fun to be married to, I have realized. Poor Rib has been taking a lot of crap from me about timing and schedules for our whole relationship, but by God's grace, I have finally decided to try to be loving rather than crank-town about stupid things! Why is it so hard to love Brendan more than I love my schedule? I don't do that to anyone else. Just poor Rib gets the worst of me! Well, not anymore! Brendan is way more deserving of my kindness than anyone else I know if only for the simple reason that he loves me the best :)... oh and, I kind of promised to be loving to him when we got up in front of everyone and exchanged vows. Also, he and I have enjoyed a few months now of what I'm ready to call the happiest time of my life. We both have been more considerate, and I'm seeing God answer a lot of our prayers about our relationship. Now the prayer is that God will give us the ability to keep up our new-found, lovey behavior the next time things get hard... or as things stay great, and we start to get lazy! So, the newer, friendlier Jesky simply called the Crepe Cafe and pushed our reservation back to 7:30. I know that sounds so simple and obvious, but now, friends, you can really see what a selfish crazy I've been in the past! It felt like a major spiritual triumph, and I'm so thankful that God has palpably softened my heart. When Rib came home, I got to greet him cheerfully with the full power of all my excitement that he had lovingly planned and suggested a date. SO much better than coming home to a nutty crabcake (that refers to a crabby, crazy Jesky... not a culinary treat)! He then got to shower and relax, and we got to the restaurant in plenty of time... and we were pretty much the only people in there all night! Kari and I were roommates for a couple of years during and after my dancing days. I'm ridiculously proud of her! When we lived together she would claim to be unable to cook and hardly ever did it, so I think it's even cooler that she's so passionate about it now. If you ever need a recipe for a nice dinner or entertaining (or just for the heck of it! ), be sure to check her blog, www.anticiplate.com. Meanwhile, I'll just be hanging out with Spud. He's going to have so many gorgeous, talented aunties that it will almost be embarrassing! Being Pregnant is Fun! Who Knew? Well, I think lots of people know that, but I never expected it to be fun. I've been thinking about this a lot lately and haven't written about it yet, so here you go. I think one of the worst things about miscarriage is that it turns you into a paranoid, anxious freak. My own personal experience and exposure to others' initial reactions to their tragedies has provided a lot of support for this hypothesis. The "freak" part came in for me because being anxious and depressed all the time felt very strange and unfamiliar. I'd dealt with depression over loss before, but the anxiety and the intensity of my feelings made me feel like a stranger to myself. Aside from anecdotal evidence, studies quoted by Darci Klein in To Full Term... determined that increased depression and anxiety typically plaque women who've suffered a miscarriage for up to one year following the event. After losing Speck, I was devastated by the thought that from then on, any pregnancy would be scary and hard. I worried that I'd always be worried about losing the baby. The first question I asked everyone who had been through it too was, "How could you do it again?" They all talked about how it was scary and required lots of faith. Some of them had to take a while before they were emotionally able to try it again. My purpose in writing all that, though, is not to dredge up the bad feelings, but to simply set the stage to communicate how amazing and God-given my joy and peace about things are now. I was scared all through my first trimester and through my second, up until the moment I saw Babytown wriggling in my belly. I suppose that an unbeliever could say that my feelings naturally improved once I had a large body of evidence to suggest that Spud is not at any risk. However, all good gifts come from the Lord, and the only reason I can rejoice in that body of evidence is because He blessed us both with health. Some people assume that health is the default, and that bad things only happen as exceptions. Now, I'm not being pessimistic, and I know that in this country, health really is somewhat of a default. But, in my life, I've seen God do the hard thing to me enough times that I don't assume that there is any default but the will of the Father, and I can't predict that. I've also always enjoyed copious undeserved blessings from God (and, really, I think everything that happens to me is a blessing from him even if I can't understand it because he has promised to prosper and not harm me, and everything works out for my good.) Anyway, I think you get my point. I am LOVING being pregnant right now. At least for me, the second trimester has been the magical time all my books say it is. My energy is much improved (though I still have my moments of exhaustion), he's moving all around, I can eat what I want without feeling sick (though, the heartburn is starting to creep in), and I'm not too big yet but still feel cutely pregnant. It's great! I'm so thankful to be enjoying all this so much. I know that God is all of his attributes to the fullest at every moment, but I'm only able to see glimmers of his character at any time. I'm grateful to be seeing and feeling his gentleness right now. This might be the first time I'm really consciously seeing that this GOOD thing is from him and for my good. It's easier for me to see how the hard things are from him and for my good. I think he's trying to make me a more thankful person. I'm praying that it will lead to me becoming more gracious and humble. I want to be able to feel as consciously thankful for my status in Christ at every moment in the way that he's made me able to feel consciously thankful every moment for my status as a healthy pregnant woman. It would be so cool to feel the stirrings of the Holy Spirit and bless God for them every time in the way that I can feel the little stirrings of my baby. Hmmm, that makes me think about the differences between the way I have "listened" for my baby and the way that I listen for the Spirit. I have to say that I've been much more diligent in trying to feel my baby than I ever am in discerning the Spirit. I read books about pregnancy almost every day, and I am constantly spending time doing nothing but focusing on the movement in my belly. Sometimes, I'll just lay quietly and focus on sensing every movement from Spud that I can. I don't sit that still in prayer or meditation! And, I'll confess: I do not read my Bible everyday. This observation probably seems obvious, but I think that this analogy has just occurred to me for the first time. I shouldn't be surprised, and am not, because the means of grace have always been taught as the way to be closer to God. I'm always reminded of a line from a confession that we use at church pretty often, "I have been anxious and troubled by many things but have neglected the things that belong to my peace." "AMEN!" I always think every time I read that line. Well, praise God for healthy babies, fun 2nd trimesters, the means of grace, and his grace to sanctify us to the end! At least, he must because I don't, but we've been doing a lot of it. I have always loved to cook, but baking isn't my thing, too much measuring and dirtying of spoons and bowls. I've been jonesin' for homemade baked goods lately, though. So, last week I made a loaf of apple bread, some chocolate muffins, and (last night) chocolate chip cookies. Brendan is happy about it but only half-heartedly, I think. Here he is, getting up to exercise every day and eating well, when, suddenly, his formerly crudite-loving wife starts whipping up sugary, carb-y treats every other day! What's a Rib to do? Eat cookies! Thankfully, all my old vegetable loving habits are still fully embedded. And, if I don't get enough protein, I get crabby-hungry/tired, so we're still pretty good about eating lots of healthy food too. Other thing on my mind these days: I want a video camera! On Friday night, Joel and Kle came over, and Joel had videos from middle school and high school of him and other dear friends ;). They were hilarious! I, of course, then subjected them to my home videos, and then Rib showed off his examples of RUF promo acting. I want to have funny videos of Boykins! How else will I be able to humiliate him at his rehearsal dinner? Just kidding, I won't do that... unless you really deserve it!